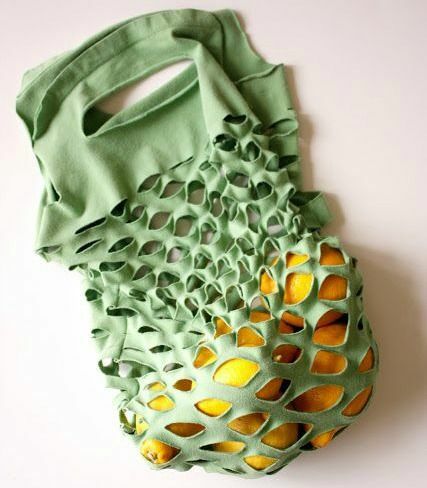 HomeBlog18 Amazing Ways to Upcycle Old T-Shirts! 18 Amazing Ways to Upcycle Old T-Shirts! Polar Vortex got you feeling blue…or, rather, feeling burr? Thankfully, spring is right around the corner and sunny days, chirping birds, and barefeet on the dashboard will be here before you know it. Along with the coming of Spring, another urge is sure to follow: the insatiable desire to run out and buy the newest, shiniest fashions available. Luckily, *silver lining* since you have a bit of time on your hands before shedding your winter layers, you can use that time to prepare for your Spring fashion debut! transforming a tee into a breezy, flowey tank? Grandma's crocheted doilies have never looked so good! Are you as "riveted" with this refashion as we are? Sometime less is more - who really needs two sleeves anyway? Because wearing shimmering butterfly wings might not be very practical. How fun would this be on Earth Day? If you don't opt for one of these Earth Day styles, of course. You KNOW it's good when even Martha Stewart has a skeleton tee-torial. Possibly the easiest upcylce projects there is! But no less effective. All you need is a men's white t-shirt one size larger than your usual size. A little shoulder, a little floral pattern, a lot of Ooh La La! Are the waves of Springy excitement washing over you yet? Start with a blank tee in a bright color like our Perfect Tee in Cancun blue! Bet you wouldn't even guess that this used to be a tee! Using a shirt in a gorgeous color like our lush purple, makes this project even more feminine. Super cute...just dont take a nap on it or you might wake up looking 100 years old! Get in the mood by doing some spring cleaning with washcloths made of "T-shirt Yarn." Keep those loose hairs out of you eyes during your furious spring cleaning! You might have to grow two more fingers per hand to do it, but this five strand braid is great! For those of us who are all thumbs, here is super easy headband option. Dress up any plain tee with some bright waves.